Home > Kid's Stuff > #2605 The Usborne Big Book of Big Trucks and some little ones too . . . 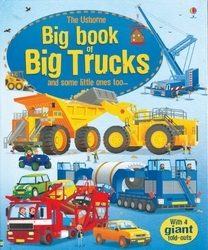 This book presents a wide variety of trucks, cranes and heavy equipment for young audiences. It’s rated for ages 3 to 5, and is built to stand the gaff, as 1920s sales literature would have put it – it’s printed on cardstock, and the 9-3/4 x 11-7/8 inch pages include two sets of facing-page foldouts for a total width of over a yard! 20 pages, hardbound, all color illustrations.